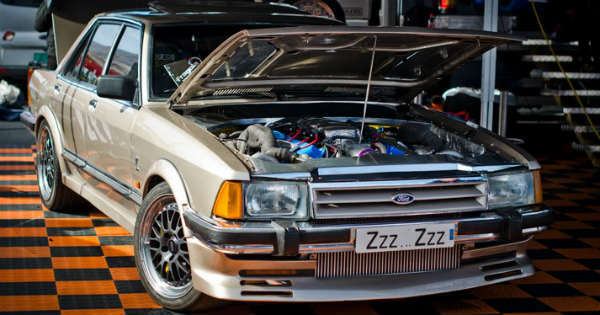 2000HP Koenigsegg V8 Engine In A Ford Granada! - Muscle Cars Zone! Just when we thoughts we have seen it all these guys came out with maybe the craziest project we have ever seen. We have seen any kind of engine swaps, like a Porsche 911 with a big block Chevy engine inside, a Toyota drift car with a Ferrari engine or a Suzuki Hayabusa engine dropped in a Mini. However, as can be seen, there are still some amazing car enthusiast that are pushing the borders and they are looking for even more extreme projects. The folowing project with a remarkable and sophisticated 2000HP Koenigsegg V8 Engine in a Ford Granada is maybe the most extreme one we have ever seen. This might be one of the fastest sleepers on the planet. Actually these guys took out the engine out of the crashed Koenigsegg CCX and decided to place it in a car with aerodynamic properties of a brick. So, what do you think about this crazy build? Would go racing against this old Ford Granada with squared body? Please feel free to share your thoughts with us and tell us what do you think in the comment section below. Koeniggsegg CCX engine in Ford Granada! That's not your average Ford Granada! WTF!